Living frugally isn’t always easy. I’m sure I don’t have to tell you that. The key to living a frugal live is to not feel like you’re depriving yourself all the time. Instead it’s about figuring out ways to get what you need and want without spending a lot. My friend Carrie is a master at this. She’s a homeschooling mom with 7 kids who enjoys life on a budget. Today I’d like to share a guest post by her with you. Enjoy! In his classic personal finance book The Richest Man in Babylon, author George Clason tells the reader that “…like a bright light in a dark cave, thy budget shows up the leaks from thy purse.” After tracking my spending for months, I had to face an uncomfortable truth. Purse – I found thy leak. And her name is Starbucks. Frugality isn’t about denying oneself all pleasures. Rather, it’s about using resourcefulness and creativity to get the things you need (and want), for less. Enjoying good coffee is one of the pleasures I’m not willing to forego, but I was spending far too much money on this line item in my budget. So I decided to do something about it. 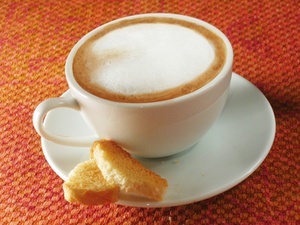 I learned to make awesome cafe au lait at home. The trick? I bought a milk frother. It doesn’t look like much. It’s a small tool that looks roughly like a teeny tiny egg beater, with a battery attached. But it makes a beautiful head of foam on your steamed milk, which poured over double-strength coffee, makes an absolutely delicious, hot creamy cafe au lait (you can also use it to froth milk to top espresso for – voila! – cappuccino). You can buy a milk frothing wand for about $2.50. I got mine at IKEA. And here’s a tip: warm your milk on the stove until it’s at hot as you want first, then froth it. That gives it a better, thicker foam. Here’s the kicker: I love my homemade cafe au lait better than what I get at a coffee shop. It’s hotter, a fraction of the price, and I like the taste more because I’m drinking it at home, with a mug instead of a paper and plastic cup, and usually with a book in hand. Sometimes I even drink cafe au lait while I practice my French (with the help of the free DuoLingo software, of course). Elle boit café au lait et parle français. Ooh la la! What are some ways you can save money without reducing your enjoyment of life? One way might be to first discover areas in which you’re currently spending more than you’re comfortable with. Ask yourself if that spending is really in alignment with your personal goals and ideals. If not, what changes can you make? Really use your noo dle. You might find that the frugal choice is actually preferable! If you’re new to shopping at Aldi or just want some ideas for cooking entire weeks worth of food with what you’re finding there, grab this book by my friend Carrie. I can highly recommend it.